The kelp at San Clemente was much thicker than it is near the more northerly Channnel Islands closer to Santa Barbara. The stems were so closely spaced that a diver could not make his way between them without frequently catching a fin buckle on a stem. 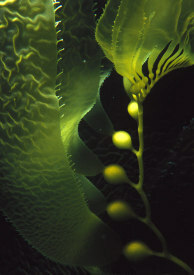 The kelp canopy covers the underwater sky in both places, but up north the holdfasts are huge, and from each comes a canopy for a large area. The canopies of the San Clemente kelp must be smaller. A jeweled infant. 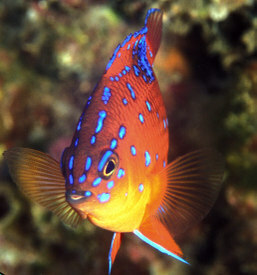 Garibaldis sport iridescent blue spots until they come of age, making them look like well-lit cyclists. This one sported a small beauty spot near one lip, like Cindy Crawford. The spots certainly make them stand out! Perhaps it's like red-shirting a football player. Are predatory fish more tolerant of those carrying these markings? Or do they prevent harrassment only from other garibaldi? Juvenile garibaldi seem to become more common as one travels southward in the Channel Islands, although I recall seeing them in numbers at Santa Cruz in 1990. This one was hanging out at San Clemente, perhaps waiting for adulthood and a current to hitch north. Garibaldi become more common as one travels south in the channel islands. This garibaldi at San Clemente is about to say "Get away from my pad, dude!" 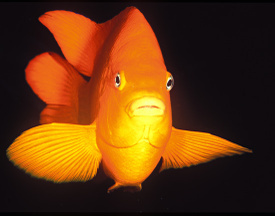 Male garibaldi famously cultivate red algae nests, to which females are drawn. 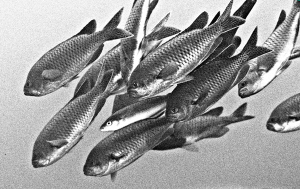 The male fish make popping noises to warn intruders away, sometimes as they pass very close to divers' heads. They don't have any trouble figuring out that they should address the divers head. Perhaps they recognize the eyes and other sensory organs. This red-eyed snaggletooth sheepshead made quite a few passes at my head, snapping at my hood. Sheepshead are usually sweet-tempered and curious about divers, like big puppydogs. 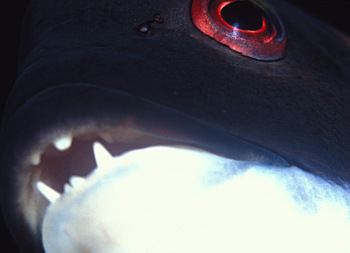 Their curiosity sometimes leads to their death, when they investigate spear-fishers. I wonder whether this one was trying to clean me, as other wrasse do for smaller fishes. Blacksmith like to form schools, and sometimes a senorita appears near the center of the school, nipping at the blacksmith. Do the blacksmith appreciate the grooming, and gather around the senorita for their turn? Or do they dislike being nipped: they seem to flinch from the biter. The blacksmith don't wait their turn patiently, like fish at a cleaning station on a coral reef. There the cleaner fish are also wrasse, but much smaller ones. Perhaps the blacksmith would like a younger, or at least smaller, attendant. This school of blacksmith was near Pyramid Head, on the eastern tip of San Clemente Island. They clustered just off the kelp, in a long school with occasional clumps like this one. 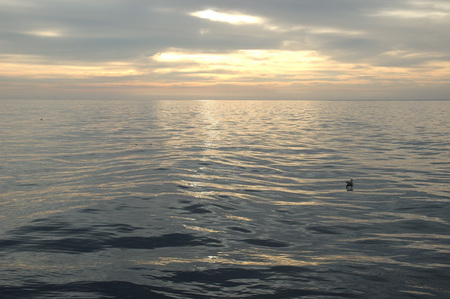 An open horizon to the east is uncommon in California. Some of the divers on the boat claimed they could see the lights of San Diego at night, or even structures by day, but I saw nothing. The 60 miles to San Diego are a lot of space, but not a lot from a giant ocean. 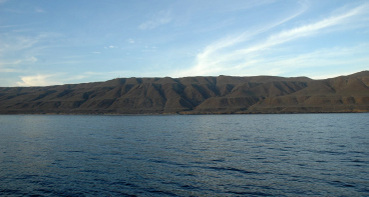 San Clemente Island looks about as inviting as a US Navy bombing range, which it is! Although far south, not far north of the ocean frontier with Mexico, it is arguably one of the Channel Islands. The terrain is dry and seems lifeless except for a few beacons and benchmarks here and there. No doubt if we were allowed to land, we'd see a lot of plants and animals thriving, protected from human interference by the unexploded ordinance around them. It's a pradoxical rule: nature does best in places humans have made uninhabitable. No doubt most creatures outside our own species would rejoice if we blasted ourselves off the planet: the start of a time they might consider a "nuclear summer".